Terminalia chebula is a perennial tree belonging to the Terminalia genus. It is also known as Chebulic Myrobalan and Black Myrobalan. This tree is native to different regions of southern Asia. 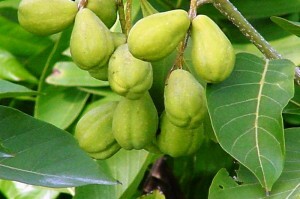 Its edible fruits, known as Haritaki, are used for various purposes. These trees are better known by their scientific name “Terminalia chebula Retz”. 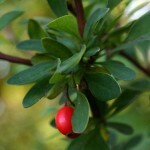 The small fruits of the Chebulic Myrobalan trees have a unique taste. 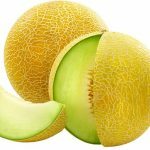 Each fruit has a single seed surrounded by the green fleshy part. Size: The drupe-like fruits are 0.79 inches to 1.8 inches (2 cm to 4.5 cm) long and 0.47 inches to 0.98 inches (1.2 cm to 2.5 cm) broad having five longitudinal ridges. Shape: They are round to oval in shape. 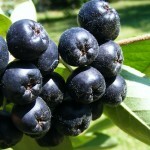 Color: These green fruits turn blackish as they ripen. 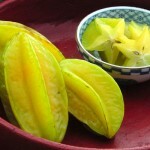 Taste: The Haritaki fruits are sweet, sour, bitter, astringent as well as pungent in taste. This large deciduous tree has a very attractive appearance. It grows around 98 feet (30 meters) in height. The trunk is dark grayish brown in color growing approximately 1 meter in diameter. Terminalia chebula has oval shaped alternate to sub-opposite leaves growing from 2.8 inches to 3.1 inches (7 cm to 8 cm) in length and 1.8 inches to 3.9 inches (4.5 cm to 10 cm) in breadth. The soft and shiny leaves are covered in silver hairs. These leaves have 0.39 inches to 1.2 inches (1 to 3 cm) long petioles. 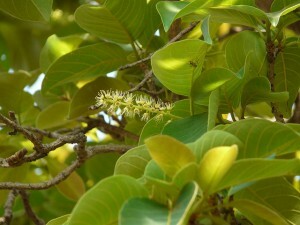 This tree has small white or pale yellow flowers with a strong and unpleasant aroma. They are indigenous to southern Asia. Their distribution range extends from India and Nepal in north to southwestern China in east and Sri Lanka, Vietnam and Malaysia in south. These trees are generally grown from seeds. The seeds are sown in spring. Clay and sandy soils are ideal for growing them. 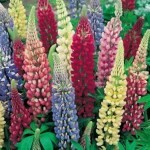 They require full sunlight and ample amounts of water for growing properly. These trees cannot tolerate cold temperatures below 16 °C. These deciduous trees remain leafless from February to early April. The flowers bloom between April and August. The Chebulic Myrobalan trees bear fruits between November and February. These fruits are harvested while they are green. Harvesting is done by handpicking the fruits. Haritaki herb has purgative, laxative, rejuvenative, astringent, expectorant, anthelmintic, nervine, appetite stimulant and carminative properties. 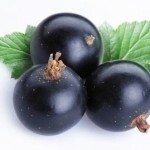 They are a main constituent of “Triphala”, which is beneficial for stomach, gums and hair. Haritaki Paste is beneficial for fighting conjunctivitis. 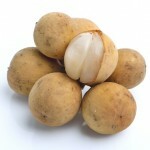 This fruit helps to fight various health conditions such as asthma, anemia, urinary stones and gout. Haritaki is good for digestion and also improve appetite. It is also beneficial for various gastrointestinal ailments, enlargement of liver-spleen, tumors, piles, colitis and worms. 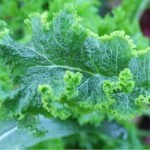 It helps to control the accumulation of fats in liver and blood. 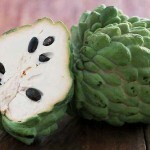 These fruits play an important role in promoting memory and intelligence. They can also boost energy and promote longevity. 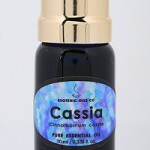 Researches show them as having strong effects against the HSV or herpes simplex virus. Haritaki fruits are highly nutritious for human health as they contain various vitamins, minerals and proteins. They are an excellent source of vitamin C. These fruits are also rich in several minerals including selenium, potassium, manganese, iron and copper. The fruits as well as the bark and roots of the Terminalia chebula trees have numerous edible and medicinal uses. Fresh Haritaki fruits are added to salads. 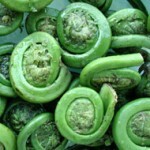 They are sometimes pickled in brine or boiled in sugar syrup to be used in food preserves. These fruits are used for making Black Salt which is used in many dishes. Black Salt is also one of the main ingredients of the popular spice blend called Chaat Masala. These fruits are a main ingredient in Ayurvedic medicine. 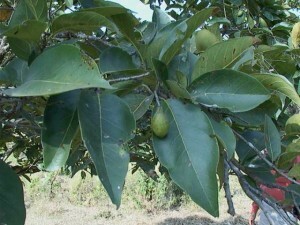 The fruit pulp is used for curing and cleansing ulcers and wounds. It is used by conjunctivitis patients, for relieving the eyelids. Terminalia chebula fruit, mixed with sunthi powder and hot water, is used for treating asthma and curing hiccups. 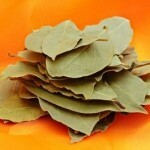 It is used for curing nervous irritability and nervous weakness. 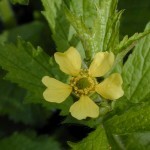 They are used in the treatments of various vaginal discharges such as leucorrhea and urethral discharges such as spermatorrhea for their anti-inflammatory and astringent. These fruits are used for fighting many digestive disorders such as flatulence, ulcer, distention and parasitic infections. Haritaki powder sautéed in ghee is consumed for promoting longevity of tissues. Dried fruits are also used for tanning and dies. 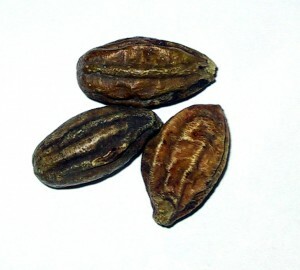 Terminalia chebula fruits are not completely avoided during pregnancy for their laxative properties. But one should always consult an expert before consuming them in any form during pregnancy as they may cause various complications. It is advisable to discontinue using these fruits in case of any adverse effects. It sometimes lowers the blood sugar levels. This fruit causes some adverse reaction in people with diabetes and hypoglycemia. 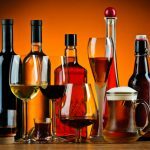 Some people may also develop allergic reactions to it. Haritaki fruit is available both in stores and online. The price for 1 pound of this fruit ranges from $15 to $20. Its powder costs between $8 and $10. In Tibet, Haritaki is known as the “King of medicines”. 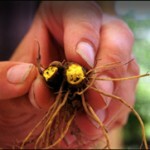 They are listed at the top of the Ayurvedic Materia Medica for its extraordinary healing powers. Hindus use these fruits in worshipping. Here are some images of the Chebulic Myrobalan trees and fruits.